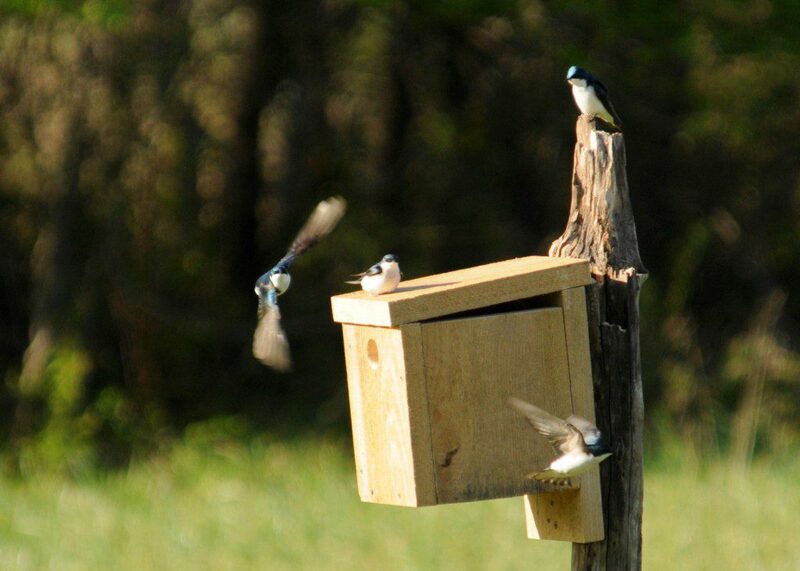 Two pairs of Tree Swallows battle over a newly-installed nest box on the Middle Run Birding Trail, at Trail Marker #1. Image by Derek Stoner, April 3, 2012. The bi-weekly bird walk at Middle Run started with a major squabble today: the competition between two pairs of Tree Swallows for a nest box looked like New Yorkers fighting over that prize Fifth Avenue penthouse suite! Just the evening before, I had installed this nest box with the help of Nick Mielnickiwicz, who is a volunteer working on habitat enhancement on the Middle Run Birding Trail. Now the Tree Swallows caught our attention as they showed their attraction to this new addition to the field habitat at Trail Marker #1. A bright male Palm Warbler perches in a cherry tree at Trail Marker #3, the aptly-named Cherry Tree Island. 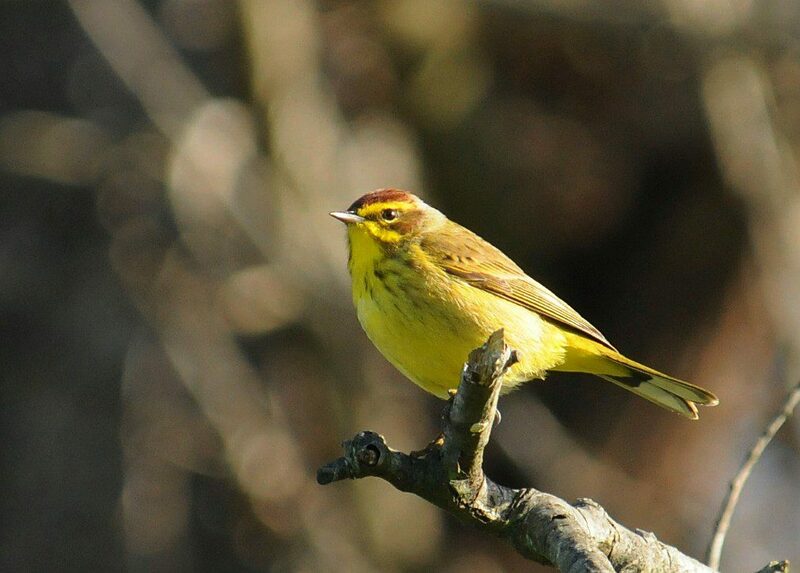 As our group made our way along the birding trail near Trail Marker #3, I caught a glimpse of a flash of yellow. Soon our binoculars found a handsome Palm Warbler perched low in a blackberry patch, bobbing its tail in a classic manner. These bright warblers are an early spring migrant, passing through on their way to breeding grounds in spruce bogs of the boreal forest. Another male Palm Warbler showed up, and they chased each other around before landing in a cherry tree. Their high-pitched trilling song was a good comparison to the high-pitched bubbly phrases of a Ruby-crowned Kinglet singing nearby. 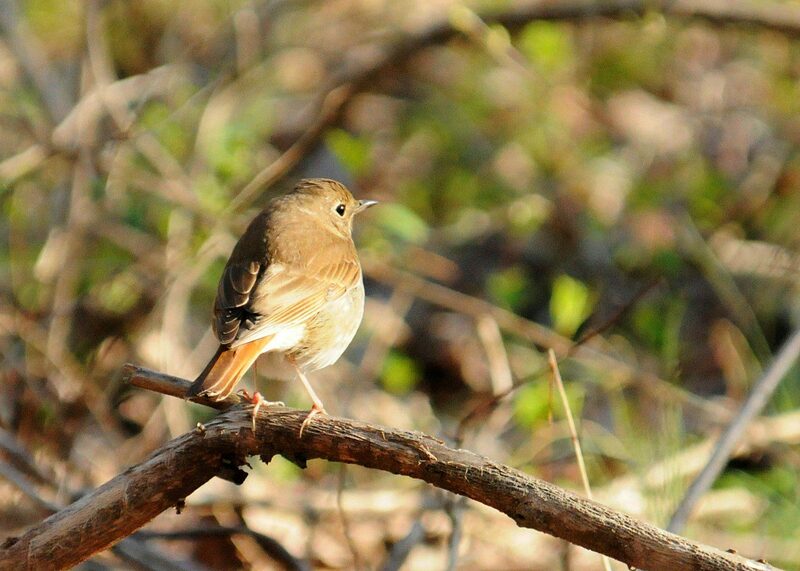 A Hermit Thrush perches on a low grape vine at Trail Marker #7 on the Middle Run Birding Trail. Image by Derek Stoner, March 30, 2012. While walking through the large field we call “Meadow Mosaic” we came across a pair of Eastern Bluebirds visiting the nest box right near Trail Marker #4. Then at Trail Marker #5 we found a real surprise: a flycatcher that was perched atop Autumn Olive bushes and actively pursuing flying insects. We managed brief views of this bird and all we can say for sure is that it is a flycatcher in the genus Empidonax, a group of birds known for the challenge of differentiating among several similar-looking species. Most likely the bird we saw is a Willow Flycatcher, but we will play it safe and say it is a very early arrival for this time of year! At Trail Marker #7 I remarked that a Hermit Thrush was there three days prior, when all of the sudden we heard the bird calling chup-chup. Soon we were looking at a beautiful Hermit Thrush slowly raising and lowering its rusty red tail. This bird is often regarded as having the most beautiful song of any North American bird. Alas, on this day we did not hear the song! 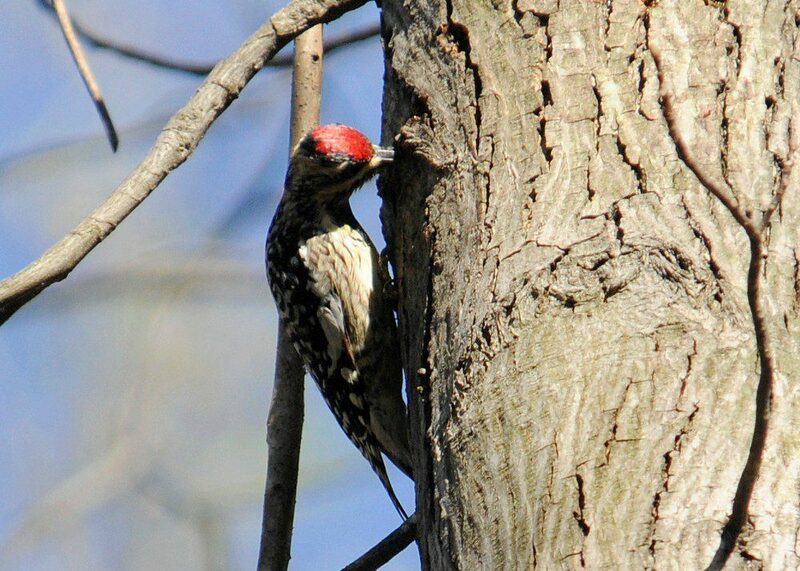 A female Yellow-bellied Sapsucker probes a sap well in a hickory tree at Trail Marker #9 on the Middle Run Birding Trail. Image by Derek Stoner, April 3, 2012. A bit further down the trail, at Trail Marker #9, Becky spotted a Yellow-bellied Sapsucker visiting its sap wells on a hickory tree. At this time of year, lots of insects are attracted to the sweet sap flowing from these holes that the colorful sapsucker drills. As a result, many other species of birds like kinglets, chickadees, and even Ruby-throated Hummingbirds will visit the sap wells to feed upon the insects. For this reason the Yellow-bellied Sapsucker is a considered a “keystone species” that is important to the overall health of a forest ecosytem. A male Louisiana Waterthrush sings loudly from right above our heads at Trail Marker #11, the bridge above the Middle Run stream. Image by Derek Stoner, April 3, 2012. 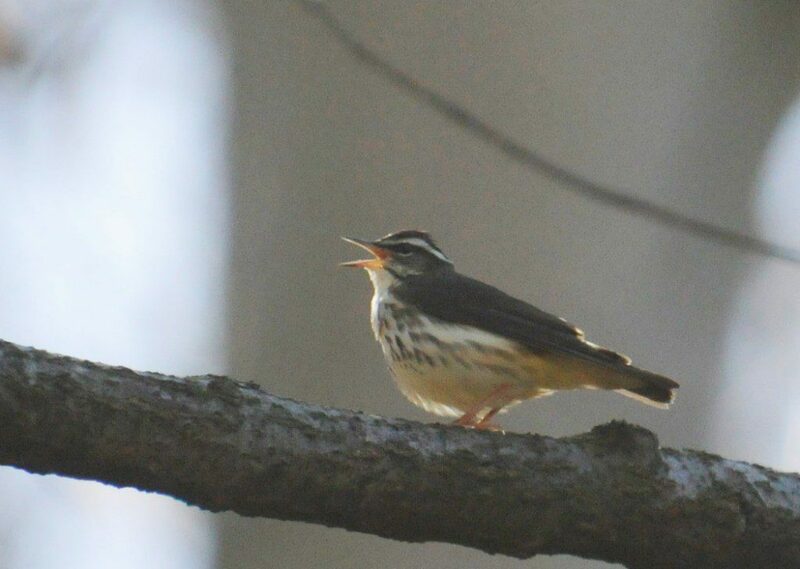 Soon the vibrant song of the Louisiana Waterthrush led us ahead on the path to Trail Marker #11, were we found three male waterthrush engaged in a singing duel. These newly-arrived migrants were trying to establish territorial claims, and chased each other up and down the main branch of Middle Run and up the little tributaries. These woodland warblers are found wherever there is clean, fast-flowing water with an abundance of aquatic insects on which they can feed. Enjoying views of the nesting Pileated Woodpeckers at the beginning (and end!) of the Middle Run Birding Trail. Image by Derek Stoner, April 3, 2012. As we had concluded the previous two walks at Middle Run with fantastic views of Pileated Woodpeckers at a nest cavity, we had to try our luck again. With spotting scope trained on the nest hole near the parking lot, we were soon treated to views of the male Pileated peeking out and looking around. Is the female Pileated sitting on eggs inside the cavity? Or are they still continuing to work on this potential nest location? Either way, we are fortunate to be able to watch these wonderful woodpeckers as they go about the business of housekeeping. We finished the walk with a count of 45 species of birds, including migrants like Barn Swallows, Golden-crowned Kinglets, and Chipping Sparrows that did not make the cut for photo features in this blog! 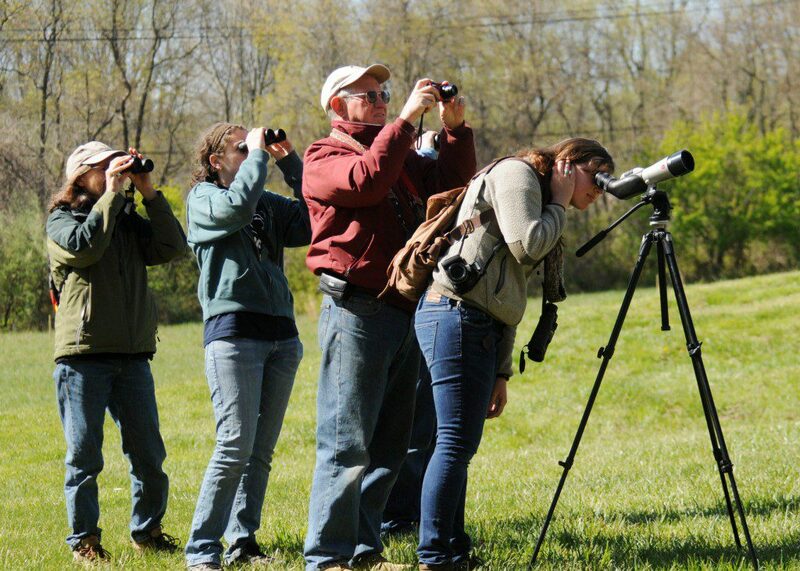 Thanks to all the participants for a great morning spent afield enjoying the birds.